The first plate for the Italian Red Cross was CRI 1 and was issued in Bergamo on August the 21st, 1911 (many thanks to Roberto Pola for this detail) and you can see it in the first picture (for the full photograph I took this detail from, go to the old photo gallery, picture 11). 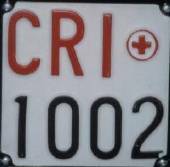 CRI Plates have had the same characteristics since the very beginning: white background, a red cross enclosed in a circle, the letters CRI in red and the number in black. On back plates at the beginning the cross was before the letters CRI (picture 1), then it was placed between the letters CRI and the number; on front plates the letters CRI were on the right of the plates, like the origin code on normal Italian old front plates, till 1996 (picture number 5), though in some cases the letters CRI and the red cross were swapped (picture number 4). 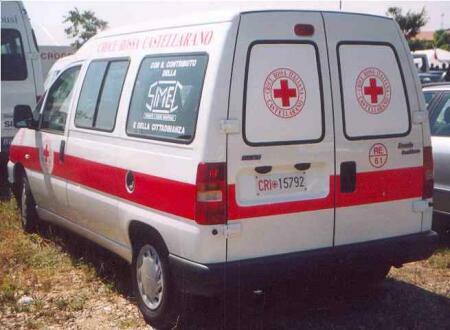 Till the 1970s ambulances and cars of the Italian Red Cross had the same numbering system for plates, then ambulances took plates from 10000 and up (picture number 6), while cars didn't change their numbers (picture number 7): when they reached 9999, they got A001 and when reached A999 got A1000 and up (picture number 8). Since the middle of 2002, many cars have had plates with numbers reserved to ambulances without any real reason (click here to see an example) and at the end f 2002 a new plates was introduced: it has got the format A000A and it's used on both normal vehicles and ambulances (pictures number 9 and 10). I have also to say that in Italy not all the ambulances are owned by the Italian Red Cross and so all the other ambulances use a normal Italian license plate. 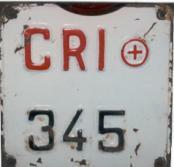 The first CRI plates were square with two lines: the letters CRI and the red cross were on the top, while the number on the bottom: if the number had five digits, the first was placed on the top line (pictures number 2 and 3). Since 1982 (?) CRI plates have been on a single line, and the back plate was made of two different parts in case it had to be arranged in two lines (pictures number 6 and 7); front plates were always the same, very small like normal Italian plates (picture number 5). The last change was in 1996 and front and back plates have been identical since then (about 13.5 x 4.2 inches, made of just one piece, picture number 8). The only change to the symbol that appears on the plates of the Red Cross was made in the 2003 when a little red print "Croce Rossa Italiana" (Italian Red Cross) between two circles was added around the red cross. Trailers: it's quite difficult to understand the system used to issue the plates for trailers of the Italian Red Cross because there are a lot of exceptions and many different forms. The oldest trailers had a plate made of three lines: the letters CRI with the cross on the first, a number, taken from the normal numbering system used also for the autovehicles, on the second, and the black print "rimorchio" (trailer) on the third. Anyway in some cases this last print was replaced by a little red "R" placed after the letters CRI (picture number 11... even if the number doesn't seem to match). Later a new plate with a very small size was used and it had the letters CRI, the cross and the number on just one line, without any special mark (picture number 12). The numbering system was independent and the number had 4 digits, starting from 0001 with leading zeros if needed. 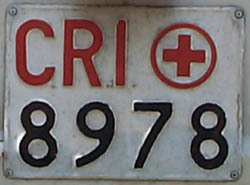 The last plate for trailers have got the full print "RIMORCHIO" in red on the top edge and the letters CRI followed by the cross and the number below (picture number 13). Sometimes plates of trailers are mounted on the side of the vehicle: in these cases there is always a repeater plate with the same number of the motor. Actually repeater plates are not supposed to be issued for the Red Cross and so these plates are not official: they are made of two pieces, the first one has got the letters CRI, the cross and a little red "R" placed in various possible positions (or even absent), the second, often made of cardboard, has got the number (pictures number 14 and 15). Test plates: in the pictures number 16, 17 and 18 you can see three test plates (prova) of the Italian Red Cross: I don't know much about these plates, but they both look very recent (1996 ?). Paolo Troncatti, who snapped the third picture, told me that there is just one of these plate for each region and so this is why it's so hard to find, though the same numbering system of normal vehicles is in use and this explains such a high number. It's interesting to notice that the plate in the picture number 16 actually is a photocopy of the original test plate, with the same look and size. In the old photo gallery (picture 14) you can also find a picture of an antique (1932) vehicle of the Italian Red Cross with a standard Italian test plate because in the past there weren't special CRI test plates. Caravan: these vehicles are often used as mobile-offices carried where the Red Cross operates. The plates are the same used for motorcycles and they have got the same numbering system. In some cases they are used with a repeater plate of the pulling vehicle (picture number 20), but this doesn't seem to be obligatory and it's possible to see caravans without repeater. Moreover, before 1980 there were dots among the letters CRI (picture number 18) and then they disappeared (picture number 19). In the past they had also a red or black "R", like the plates of trailers, but today this is not used any more. Motorcycles: the Italian Red Cross in the past had many motorbikes, while today there are just some scooters still in use. Their plate is square (about 6.6 x 6.6 inches), with the letters CRI and a cross enclosed in a circle in red on the first line and a serial black number in the second (the number 1.000 was reached very recently): the pictures number 21, 22 and 23 show some of these plates, in order of age. The numbering system is independent from that used on the other vehicles and the same plates are used also on low-powered scooters with less than 50cc, for caravans and for work vehicles. Roberto Pola told me that in 2002 special CRI plates for low-powered scooters with 50cc engine were made, but they were never used. 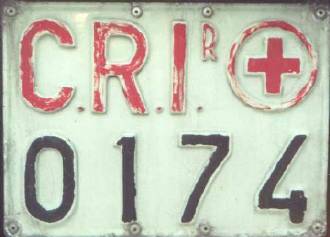 Provisional plates: In 1960s it was common a long delay to have the plates of the Italian Red Cross and therefore in the while normal Italian provisional plates were used. You can find a picture of the inauguration of an ambulance with one of these plates in the old photo gallery (picture 28). Roberto Pola made a table with the list of the vehicles of the Italian Red Cross seen directly on the roads: click here to see it (it's in PDF format). During the war of Korea in 1950 the Italian Red Cross sent a field hospital: the vehicles used in that occasion were American and had two plates, the American and the CRI. 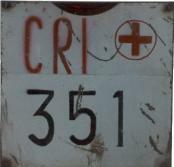 This CRI plate was painted in white directly on the bumper and didn't have the typical red cross that you see on normal CRI plates (picture number 24; the full image where I took this detail is available in the old photo gallery). In this web site you can also find a picture of a sample plate of the Italian Red Cross: to see it, go to the page of sample plates. 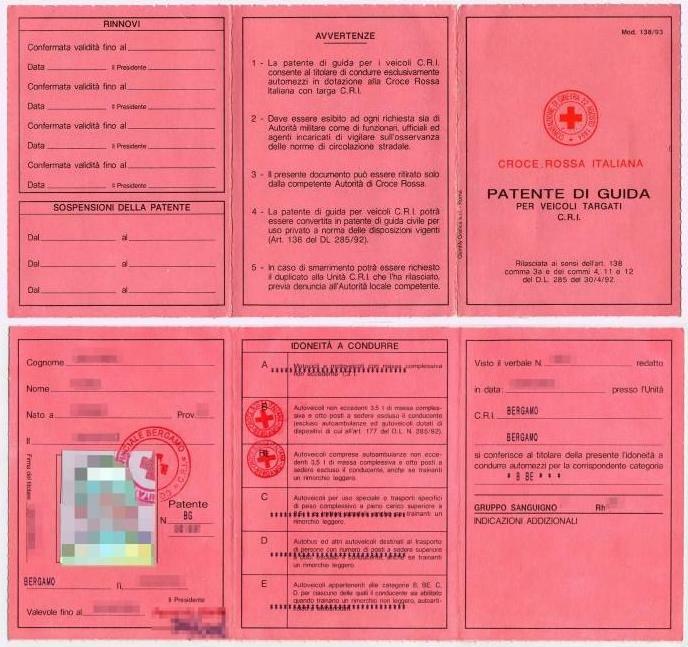 The vehicles with plate CRI have a special registration book issued by the Italian Red Cross and to drive them a special driving license is required and also this is issued by the Italian Red Cross. If you want to see a picture of one of these driving licenses (with the data blurred, of course), click here. I want to thank Guglielmo Evangelista very much for his history of CRI plates and for picture number 18 (taken from C.T.I., foto Farabola), Roberto Pola for the pictures 1, 2, 4, 6, 9, 10, 11, 12, 13, 15, 16, 19, 20, 23 and 24 and for his help about the vehicles of the Italian Red Cross, Karsten Kuhn for the picture number 7, Paolo Troncatti for the picture number 17 and Adolfo Arena for the pictures number 21 and 22. Picture number 23 is taken from the book "La logistica dell'Esercito Italiano".